Good things often come in small packages, especially if they are tidily wrapped. Such is the case with our DNA, which in our vigorous youth is carefully tucked into our cells. Unfortunately, as we age, our DNA is often kept less neatly, as simple blood draws reveal. In blood, cell-free DNA (cfDNA)—that is, DNA released into the circulation by stressed or degraded cells—preserves the state of DNA packaging, providing a biomarker of biological age. Age- and health-related differences in cfDNA have been sought by scientists based at Brown University. These scientists, led by Nicola Neretti, Ph.D., an assistant professor of molecular biology, cell biology, and biochemistry, extracted cfDNA from blood samples from people in their 20s, people in their 70s, and healthy and unhealthy centenarians. The four groups of people, the Brown team found, tend to have cfDNA that display different nucleosome patterns. Nucleosomes are DNA packaging elements that incorporate histone proteins and work something like spools around which threads of DNA are wound. Depending on how nucleosomes are spaced, stretches of DNA may be more or less accessible, influencing cell function. 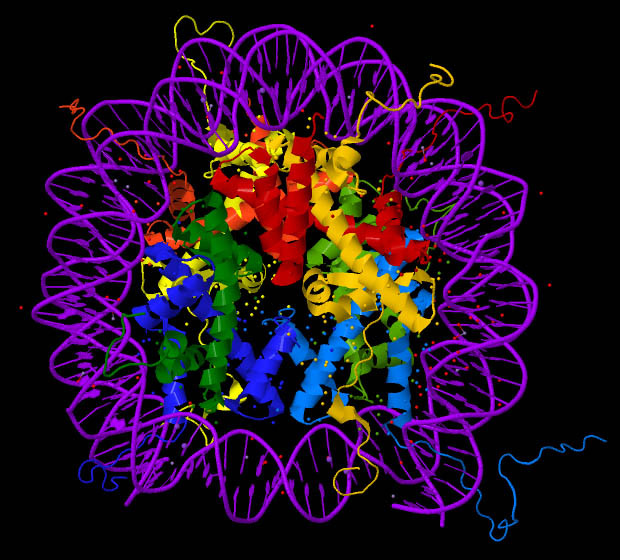 Nucleosome packing is one aspect of the epigenome—the collection of heritable changes that affect gene expression or activity without affecting the DNA sequence, or genome. According to the Brown researchers, properly spaced nucleosomes can preserve proper cellular function and promote health. The Brown team determined that nucleosomes were well-spaced in the DNA of the volunteers in their 20s but were less regular in the older groups, especially the unhealthy centenarians. Additionally, the signal from nucleosome spacing for the healthy centenarians was more similar to the signal from the people in their 20s than people in their 70s. Detailed findings of the Brown team’s work appeared in the journal Aging Cell, in an article titled, “Cell‐free DNA as a biomarker of aging.” For example, the article describes how next-generation sequencing of cfDNA was combined with complex computational analysis to allow the reconstruction of nucleosome patterns. These techniques were used to assess nucleosome spacing for different regions of the genome—both areas that are typically open for expressing genes as well as areas that are normally tightly packed. The team detected a reduction in cfDNA signals at the beginning of two common transposons with increasing age. This suggests that these transposons are less locked-down in the unhealthy centenarians and people in their 70s and thus more likely to be “copying and pasting” themselves into the genome, causing genetic mayhem. Scientists first found cfDNA in the blood of cancer patients, and the fragments can be useful for diagnosing cancer. Earlier research has found that cfDNA is produced by dying cells, and as the cells die, the DNA is cut in between nucleosomes, Dr. Neretti said. “Ideally, you would like to track a population of individuals over 20 or 30 years to see how each individual’s epigenome changes, and the rate of change, as they age,” he said. A large study could allow the association of epigenomic differences with health conditions, lifestyles, or diets, he added. They are working to optimize the process of extracting cfDNA from blood. In mice, they can reliably get the amount of cfDNA they need from a quarter teaspoon of blood. Neretti thinks that they don’t need to sequence the whole genome to detect the age- and health-related epigenetic changes. For this study, they did whole-genome sequencing, but he expects that sequencing 2–5% of the genome could be sufficient. In addition to refining the nucleosome positioning analysis, the researchers would like to study another kind of epigenetic marker—DNA methylation patterns—in the cfDNA, Neretti said. This would provide additional information, including markers that can indicate what tissue the cfDNA came from. Determining the sources of cfDNA at different ages—or what tissues are experiencing a lot of cell death—could provide insights into the aging process.